Indigenous groups in Peru ended a 43-day protest after winning healthcare and consultation rights regarding Block 192 oil fields, leaders announced last Tuesday. Community members are celebrating their triumph, said Aurelio Chino, president of the Native Quechua del Pastaza Federation, after the government of President Pedro Pablo Kuczynski was forced to the negotiation table. 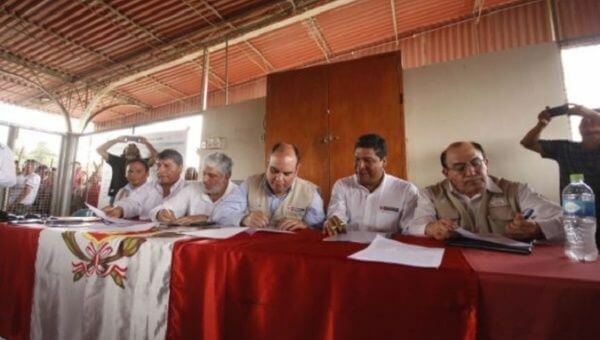 Members of Peru’s Achuar, Quechua and Kichwa communities met with government officials last month to discuss the details of Block 192, a two-year contract signed with the Canadian Frontera Energy Corp. which hasn’t had access to the oil since protesters seized the oil wells on Sept. 18. Protesters want the government to clean up oil pollution in the region and commit to including the communities in talks on long-term oil drilling plans. Block 192, located on the border of Peru with Ecuador, represents 17 percent of the country’s total oil production, with a daily extraction of 11,000 barrels of crude from around 16 wells. Frontera Energy Corp. will be summoned to take part in dialogue sessions with villagers in order to determine a new exploitation contract that serves all parties, the ministry said. The new agreement will be organized with due respect given to the traditions, customs and social and environmental concerns of the Indigenous communities. As part of the agreement, the government of Kuczynski promised to apply an Indigenous rights law before awarding any new, long-term oil drilling contract for Block 192 — a chief demand of protesters, the energy and mines ministry said in a statement. According to the agreement, the ministry of health will spend the next ten days implementing an emergency health care program for the Indigenous communities and form a commission of direct environmental cleanups at Block 192. This article was originally published at teleSUR. It has been re-published with permission.